A fast paced and addictive real time strategy game, based on the board game Risk! 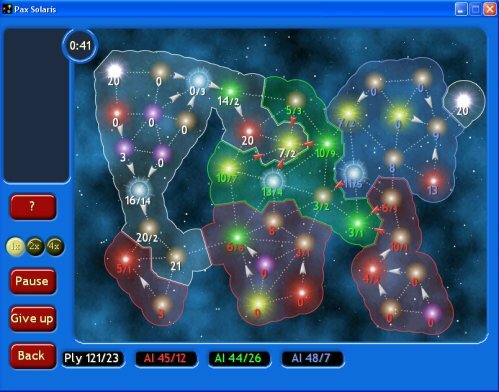 Pax Solaris is a very tense and challenging real time strategy game, loosely based on the board game Risk. You will be amazed at the strategic depth of this game, even though it is very easy to learn and play. You will have to conquer stars, break up and force enemy fleets to surrender, carry out rapid attacks and tactical retreats. Multiplayer modes are available (online and offline). You also get a level editor. 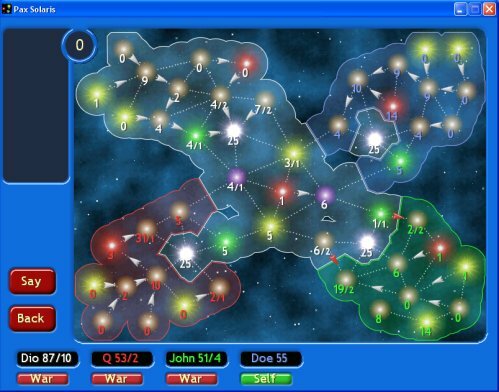 Pax Solaris is a fast paced and addictive real time strategy game, based on the board game Risk. You will be amazed at the strategic depth of this game, even if it is very easy to learn and play. You will have to conquer stars, break up and force your enemies fleets to surrender, carry out rapid attacks and tactical retreats. Multiplayer modes are available (online and by taking turns on a single computer). A level editor is included. Five Card Deluxe - Five Card Deluxe - Poker is Hot! Give it a Try! Net Cribbage - One of the earliest and most enduring of the classic card games you can play against computer or real-life opponents! Home Poker Tournament software - Poker Tournament Manager adds a professional feel to your poker game, just like a Las Vegas casino! Japanese Videopoker - A new videopoker game in Japanese style! My Solitaire - My Solitaire is World's Top 100 Most Played Solitaire Card Games Collection. Video Poker Calculator - Improve your odds and win more money with Video Poker Calculator 2.0. Try now !